Clearly I have a thing for holiday decor that looks like clothes, because here’s another one! 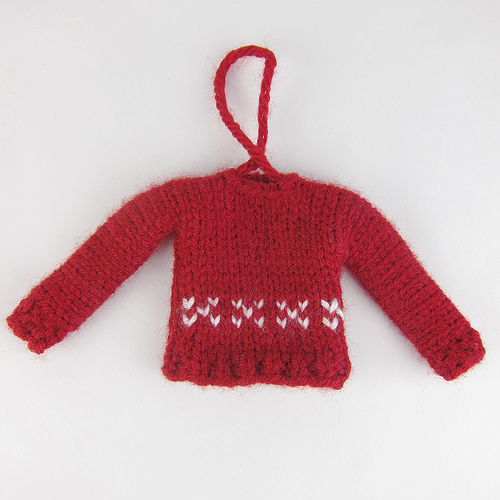 This tiny Christmas sweater ornament from Kat at Just Crafty Enough is especially cute because it’s worked in one piece, meaning it will knit up fast and with less finishing than if you had to knit front, back and sleeves all as separate pieces. This project would be darling on the tree, of course, or decorating a gift bag (maybe as code for the handknit sweater that’s inside?). I had a dream this year — unfulfilled, of course — of making a garland all of little miniature clothes items, and this would be a great addition to that project in my head! As an aside, if you wonder why Just Crafty Enough is getting so much link love lately, aside from her stuff being really cute, is that she sends me links! If you want me to show off your projects, too, click on “send us gossip” above.